Overall length 113'8" - beam 17'6" (28'0" across paddle boxes) - draught 4'0"
Moved in August 1967 to the River Medina, Isle of Wight, alongside PS Medway Queen. Operated for 20 days in 1984 with a volunteer crew and a 12 passenger limit venturing as far as Gravesend. Passenger Certificates were obtained to allow commercial operation in the 1985 season. 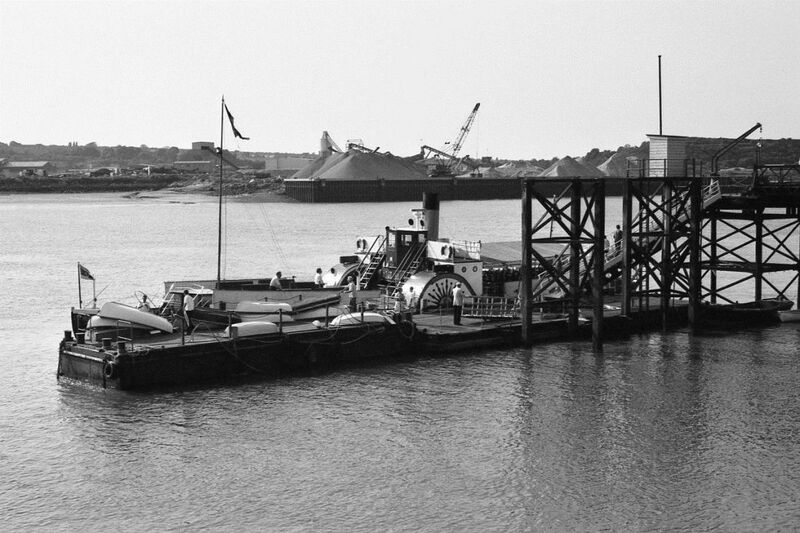 1985-2012: Continued expansion of operation on the Medway and Thames estuary and improvement of facilities under guidance of Captain John Megoran. The webmaster comments : Indications from the Dartmouth Company are that they are very pleased with their decision to engage Kingswear Castle as part of their fleet, seeing the wider benefits of having such an unusual and attractive ship as part of their offer to the tourist. This echoes experience in Switzerland where the larger PS Blumlisap on Lake Thun was saved, restored and operated by enthusiasts in conjunction with the incumbent lake cruise operator (the paddler's former owners) before more formal re-incorporation into the commercial fleet. The most recent example of such is on lake Neuchatel in Switzerland with the eponymous PS Neuchatel. The survival of a large number of paddle steamers in Switzerland has been because of partnerships with the local operators, including financial support from enthusiast bodies, to ensure that these ships survived periods of fleet modernisation to fulfill the important "heritage" role so appreciated by today's tourists. Operating such a ship independently was, is and will continue to be an enormous task with big financial risks. 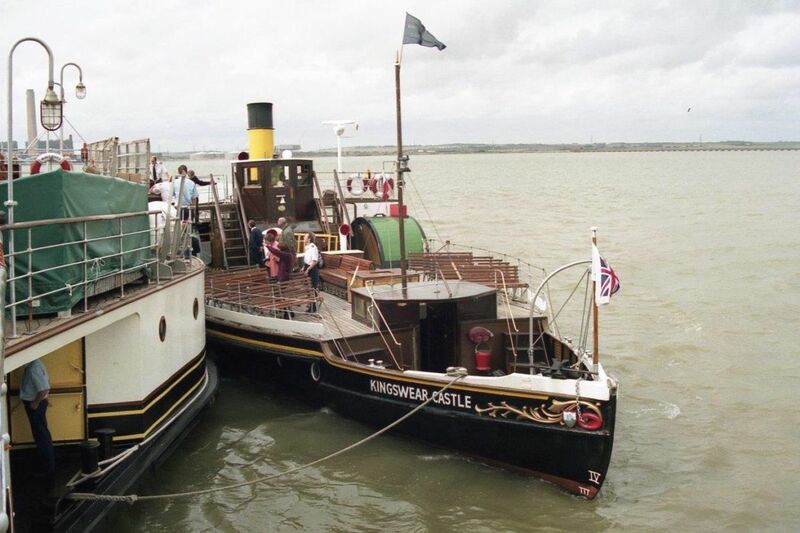 Kingswear Castle is one of two paddle steamers owned on behalf of the Paddle Steamer Preservation Society and her return to service has meant that there are only two operational paddlers in the UK. During Waverley's traditional autumn visit to the Thames, her schedulers have always tried to ensure that there was a meeting between the two ships on the Medway. On this occasion, 27th September 2000, a little more than ther normal "parade of steam" along the Medway was planned. The two ships were to exchange passengers in mid-channel. Although the ships met (see photo above by kind courtesy of Phil Barnes), an exchange was aborted as the waters roughened. Despite failing in this unusual procedure, there remained the opportunity to photograph the other vessel sailing in procession. Above : Kingswear Castle at Thunderbolt Pier, Chatham on June 14th, 1992 by Phil Barnes.